Helsinki is the Baltic Sea’s best-kept secret. With a sizzling food scene and a thriving start-up ecosystem, the city has a lot to offer—and yet it’s still overshadowed by its neighbors Stockholm and Copenhagen as a destination for visitors and talent. In response, the city has been evolving its marketing to highlight the unique experiences locals and visitors enjoy in Helsinki, including the opportunities and quality of life Helsinki can offer to international talent. 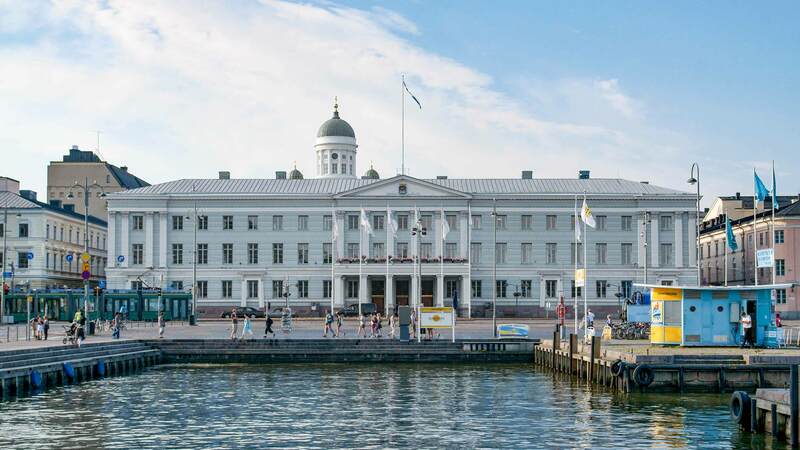 The City of Helsinki adopted a new brand strategy and identity at the beginning of June 2017 in conjunction with the thorough reform of the city organization. Our challenge was to build a digital service that would support this mission and help people find the best of the city. It would also be the first opportunity to bring to life Helsinki’s new brand identity. Helsinki is for a good life. Helsinki wants to be the the most functional city in the world, and a place that attracts people and companies that work towards a better world. The vision of Helsinki speaks to every city resident, to the trade and industry, as well as to everyone who visits Helsinki. Day by day, Helsinki has to be a better city for all of us. Helsinki cannot solve the big challenges - nor is it even sensible to do so - on its own, but instead we need strategic partnerships with everyone who is interested in developing Helsinki. One of the new brand identity spearheads was the new My Helsinki concept — all Helsinki city marketing is based on genuine recommendations. 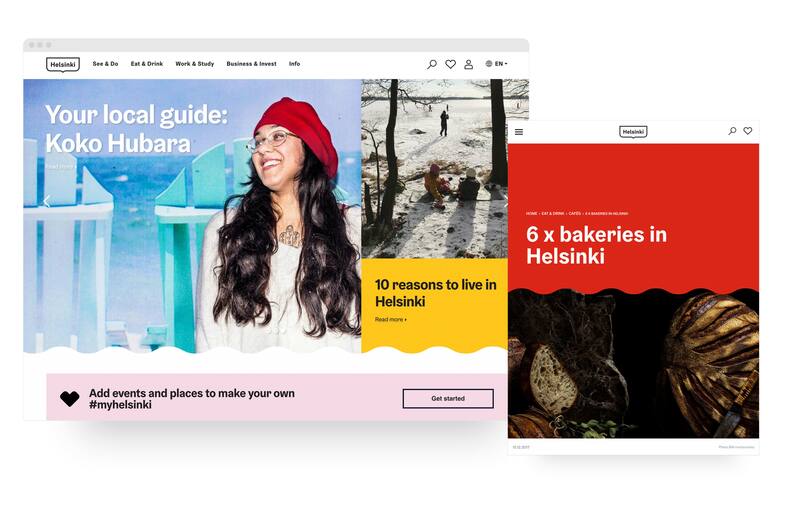 The new website needed to be in line with the changes to Helsinki’s city marketing strategy implemented by Helsinki Marketing, a company owned by the City of Helsinki. One of the new brand identity spearheads was the new My Helsinki concept — all Helsinki city marketing is based on genuine recommendations. Its target audience is not only visitors, but also locals and talent interested of moving to Helsinki. 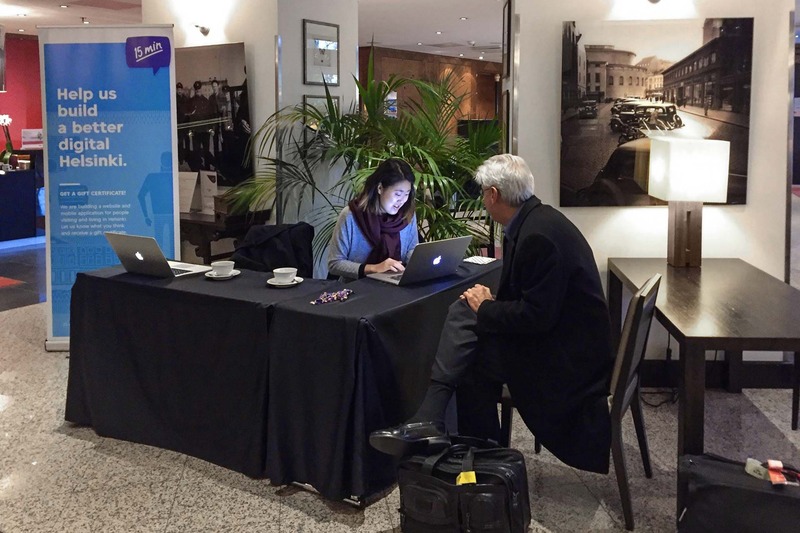 The aim was to further enhance Helsinki’s international visibility and appeal, as well as to make it easier to find Helsinki’s services and offerings. 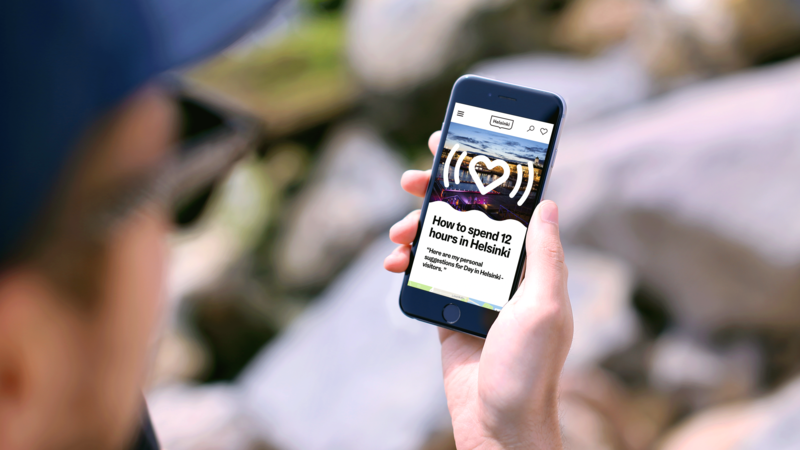 Our goal was to design a service that will help people find the best of Helsinki in a personal, inspiring and mobile-friendly package. Helsinki aims to establish a continuous dialogue between the city and its residents. In order to design a useful and inspiring service, it is vital to first understand the needs and motivations of Helsinki’s visitors and residents. Therefore we interviewed visitors and city employees about their experiences exploring Helsinki, and the discussions helped us understand their diverse perspectives. One of the key insights was that many of the activities the city has to offer were discovered through different sources. There was a real need for a service that featured the most interesting events, restaurants and sights in one place. There was a real need for a service that featured the most interesting events, restaurants and sights in one place. 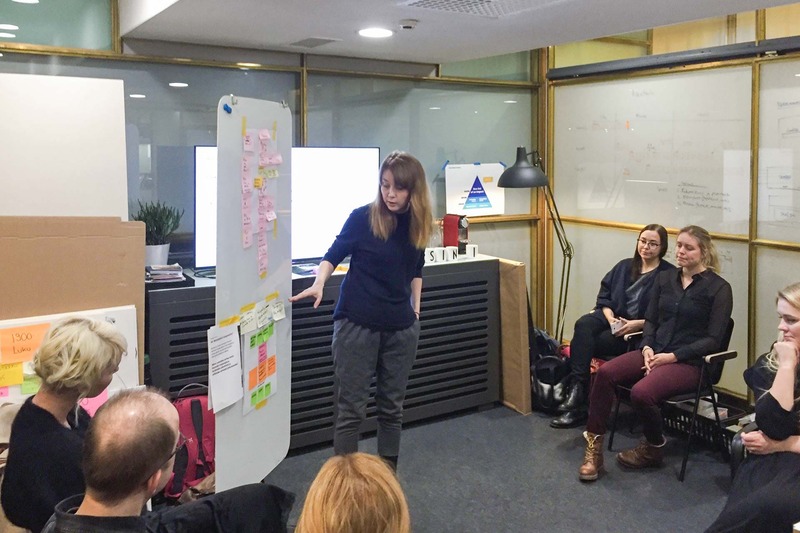 To work closer with city employees, we set up a co-working space in Helsinki Lab, a glass room within the lobby of the city hall, and filled it with our rough drafts, post-its, and Finnish chocolate. Activating people to share their favorite places and events of Helsinki was the core of the strategy. Personal recommendations are overwhelmingly effective marketing tools in the social media environment. Helsinki marketing relies on the belief that visitors and international experts who work in Helsinki are interested in the same things as the locals are. The strategy was simple: MyHelsinki.fi should help find the best local experiences in Helsinki and the recommendations should be trustworthy. In keeping with the website’s service promise, “Your local guide to Helsinki”, all the content has been compiled by locals. MyHelsinki.fi is based on personal and genuine recommendations - as are all concepts produced by Helsinki Marketing such as #MyHelsinki Residence, a concept inviting international influencers to experience the city. Absolutely no paid brand endorsements, partnerships or sponsored content are allowed. The locals are the best marketers for their own city. It’s their opinion that we trust. In order to validate the chosen strategy, one main KPI was set for the launch: engaging the locals themselves. One of the key features is My Helsinki lists, a visual map of favorite places in Helsinki that anyone can create and share. My Helsinki lists are a way for locals to let the world know about their city. My Helsinki lists are a way for locals to let the world know about their city. Helsinki is a world leader in moving to an open data approach. 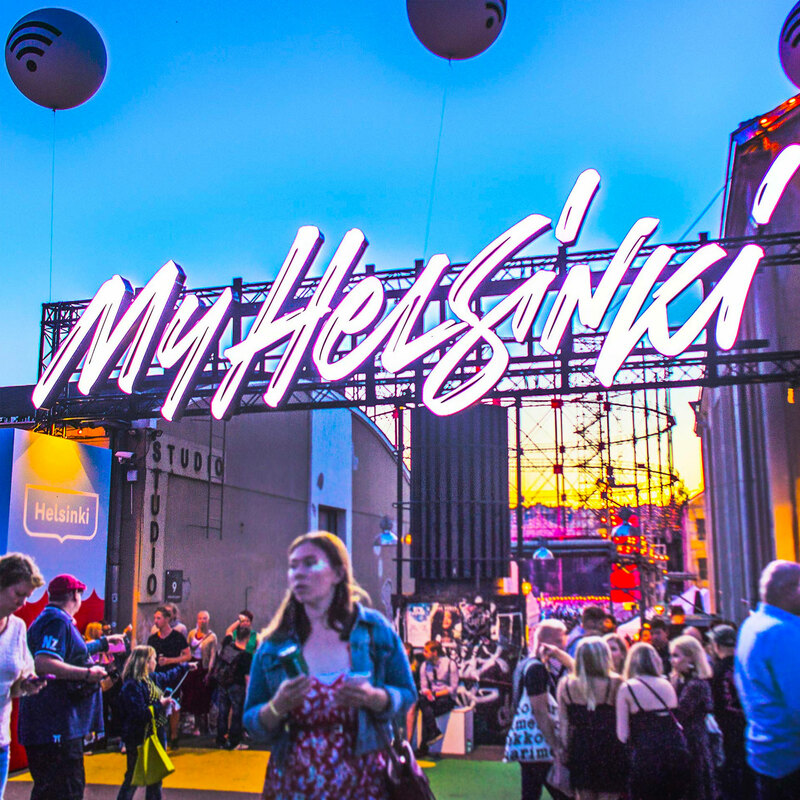 MyHelsinki.fi utilises the event and location open database maintained by Helsinki Marketing which is globally unique. 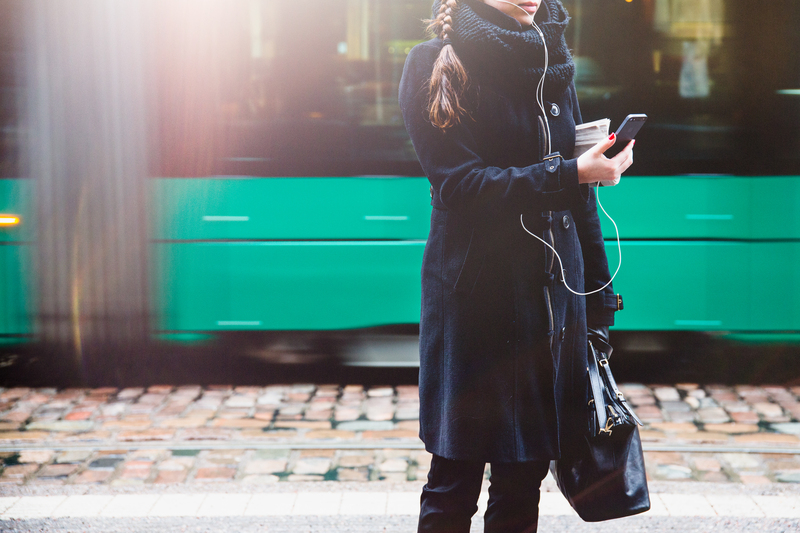 The City of Helsinki has an exceptional amount of open data that MyHelsinki.fi-service utilizes by highlighting local events, shops and restaurants in particular. The data is good quality and up-to-date, service provides can also update it themselves, if needed. The open database serves as a platform for My Helsinki list feature. As the development continues the service also has the chance to offer users individually tailored recommendations based on the user data. Development of site was done in agile sprints in close cooperation with developers, designers and the city’s marketing team. It was crucial to contribute to open source data of events, so that anyone can use the same data when building services. Local tastemakers such as Timo Santala (Restaurant Day), Suvi Saloniemi, Renaz Ebrahimi and Jaana Rinne among many others. 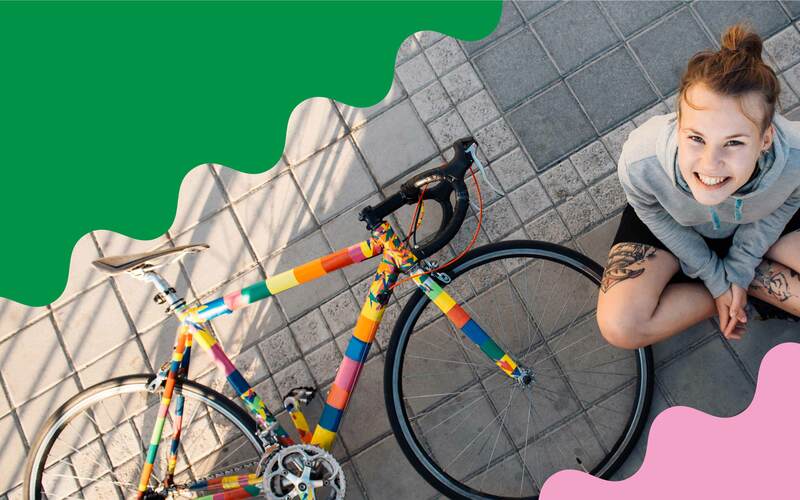 The website and its services were promoted by the likes of chef and restaurateur Antto Melasniemi, actress Seela Sella, startup entrepreneur Maria Ritola, rapper Gracias and YouTuber Mariieveronica, all of whom have contributed their own personal Helsinki tips. 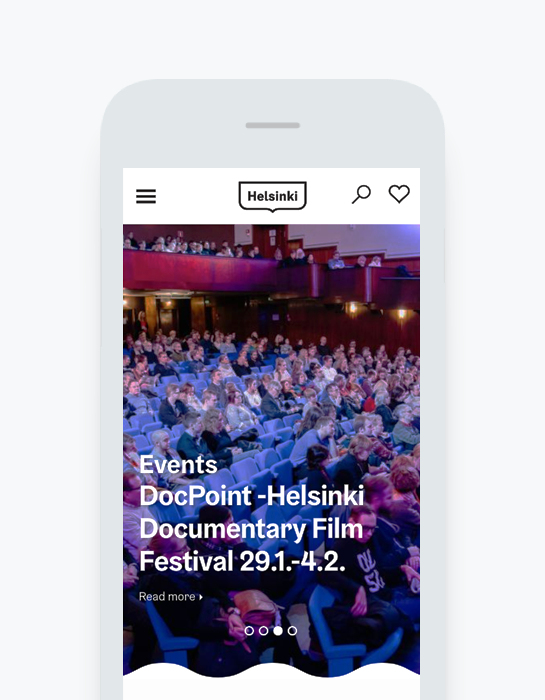 The site development was made together with the people of Helsinki, gathering direct user feedback via social media, local media partners such as Radio Helsinki and face-to-face at the City Hall. It is very important to attract local residents and businesses to help develop the service. The design is based on user needs, so the design team gathered feedback already at the start of the project. Users could – and still can – send feedback and improvement suggestions also via email or by using the online form at MyHelsinki.fi. A lot of feedback emphasized the need to highlight further local experiences, therefore a new “Neighborhoods” section will be introduced later this year. Also a new marketing concept will be launched soon, gathering tips from locals of what’s best in the city and rewarding the local favorites. Especially the brick-and-mortar entrepreneurs deserve the praise from locals to be made public, cultivating good will and sense of pride in the community. The site has enjoyed a rapid growth in visitors during the first 6 test months: from 24 000 visitors in launch month July 2017 to 128 000 visitors in December 2017, an impressive increase of 1935%. As the site is still developed with the local audience, most visitors are from Helsinki (a city of 600K citizens). The visitors are returning with a rate of 30% and reading approximately three to four articles per session. Our KPI - engaging the locals themselves - was excelled. In February 2018, when all language versions are introduced, all international visitors will be redirected from visithelsinki.fi to MyHelsinki.fi. During 2016 and 2017, visithelsinki.fi has had over 3,5 million annual users. Before the launch hashtag #myhelsinki had been used approximately 300 times on Instagram. Today we have over 160 000 pictures on Instagram marked with the hashtag #myhelsinki. On social media My Helsinki was launched in August, when existing social media channels changed their names and content strategy. The main channels are @myhelsinki on Instagram with 86K followers and Facebook with 25K followers. Both channels enjoy an organic growth of 300-600 followers a week. My Helsinki and its open data based approach was picked up by Tencent as a basis for a WeChat miniapp that will introduce the city to a billion potential Chinese visitors. 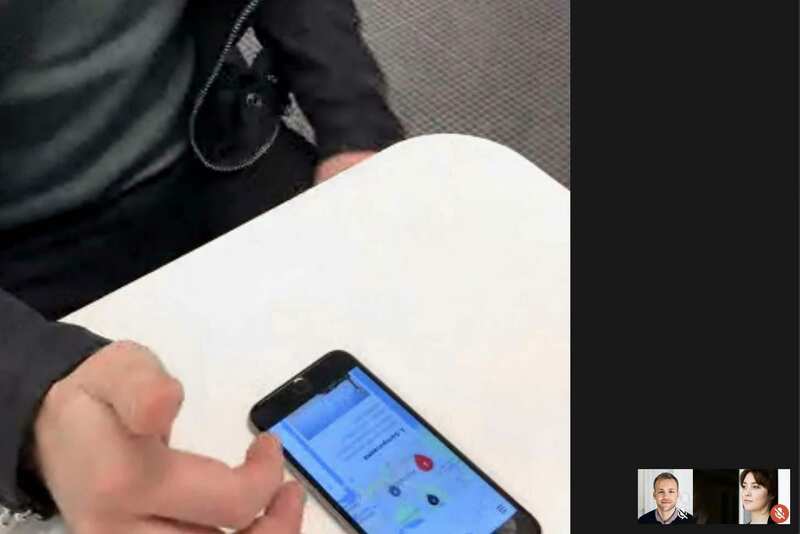 This is one of the first city apps Tencent will launch for WeChat globally.